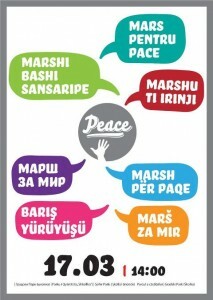 The march is scheduled for Saturday, March 17, 2012, at 2pm in Skopje City Park, and the word is being spread via this Facebook event  [mk], Tweetvite event  [mk], the Twitter account Zaedno za mir  (Together for Peace) and the hashtags #PEACEmk, #ZaednoZaMir, #zzm or #marshnamirot . The march comes as a reaction to a series of violent inter-ethnic developments , including slow [mk , sq ] and controversial reactions by the authorities to the murder in Gostivar after/during an argument over parking space on February 28, the after-funeral protests and the stoning of select shops, followed by a series of violent incidents involving “spontaneous” “revenge” attacks – beatings of the passersby on the streets of several Macedonian cities and in the public transport in Skopje, leaving dozens of people with serious injuries. Participants of the initiative have been expressing their commitment to live together with their peers from different ethnic groups by providing translations of the call, and also by producing various other works. 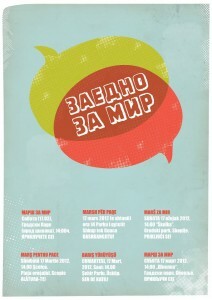 For instance, graphic designer Nebojsha Gelevski-Bane created  the poster above, and theater and film director Srđan Janićijević posted  another pro-peace graphic, and a video ad.